Heat olive oil in a non-stick pan. Add garlic and sauté till golden brown. Add onion, mix and sauté till translucent. Add button, shimeji and enoki mushrooms, mix well, and cook for 4-5 minutes. 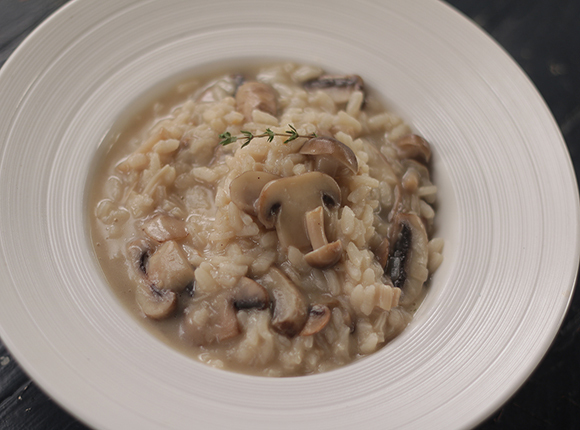 Add Arborio rice, mix well and cook for 1-2 minutes. Add white wine, stock and salt, mix and simmer for a few minutes. Add thyme, mix well, cover and cook for 10-15 minutes. Add cream, butter and parmesan cheese and mix till the cheese melts. Garnish with a thyme sprig and serve hot.